Most parents don't realize that their child is in the wrong car seat till it is too late. I've heard that as many as 9 out of 10 are actually installed wrong- crazy high number. The manuals that come with most car seats are extensive and jam packed with tons of information, but not many people take the time to read them. If you are unsure if the car seat you are using is right for your child, or aren't sure if it is installed right Child Passenger Safety Week (September 17-23, 2017) is a great time to figure things out. During Child Passenger Safety Week, more than 1000 events are expected in 45 states across the country to raise awareness for proper car seat installation and usage. The week culminates in “Seat Check Saturday,” where Certified Child Passenger Safety Technicians will help parents and caregivers make sure their car seats are installed correctly. In most cases, this service is FREE. If you are feeling overwhelmed, or just want a second set of eyes to check out your child's car seat set up, now is the perfect time. After all. the right car seat can make all the difference in a crash. Every 33 seconds* a child under 13 is involved in a car crash in the United States. Car seats, if used correctly, can dramatically reduce the risk of death or injury. But over half of car seats are either installed or used incorrectly, and 1 in 3 children killed in car crashes in 2015 was not in a car seat, booster seat, or seat belt at the time of the crash. To make sure you have the right seat for your child, visit NHTSA.gov/TheRightSeat, or find a Child Passenger Safety Week event in your area. 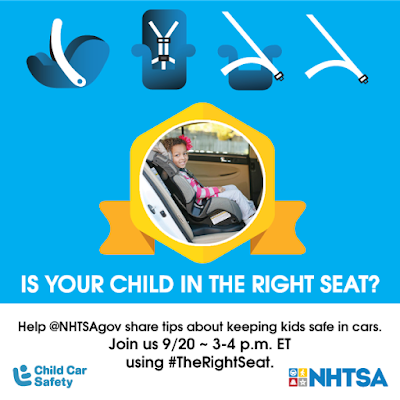 During Child Passenger Safety Week, many communities will have Certified Child Passenger Safety Technicians on-hand to provide education on how to use car seats, booster seats, and seat belts for children. To find events near you, including free car seat checks, visit bit.ly/CPSTech. *According to 2015 data from the U.S. Department of Transportation’s National Highway Traffic Safety Administration (NHTSA). This is really a great reading about car seat! I am in agreement with you that most parents don't realize that their child is in the wrong car seat till it is too late. Do you need infant car seats? If yes then check now. Thanks and keep it up! Loving this post too! And another request if you could share where those white beaded edged plates are from? So love them!! People buy cars according to their choices but from the beginning it is really hard for them to get to know the car. They do not know the functions , ins and outs of that car. So the best solution is the manuals. They can get car manuals free from reliable sites which will help him or her to ride the car. Be the precise blog if you have wants to learn about this topic. You comprehend considerably its nearly onerous to argue to you (not that I personally would needHaHa). You undoubtedly put a new spin for a topic thats been discussing for some time. Nice stuff, simply nice! It is really important to be careful with the seat belt as it ensures the safety. There are other things which also need to be checked if they are working fine or not. You will find the details in free car repair manuals Seat. With a front-engine and front-wheel-drive layout and a five-door multipurpose body style, the Seat Altea was produced in 2004. I got to know this information from a website named Manuals.co and they also have car manuals of cars Seat in their other services.